Is Neptune Mostly Made of Gas? Until 2006, Neptune was the second-farthest of the nine known planets from the sun – at least most of the time. Then, Pluto, the erstwhile ninth and outermost planet in the solar system, was reclassified as a "dwarf planet." That left Neptune, the fourth and perhaps most mysterious of the gas-giant planets, with the distinction of having the most distant orbit of any planet from the center of the solar system – and from Earth, which, from a Neptunian perspective, is practically in the sun's lap; Neptune, after all, is 2.8 billion miles from the sun – 30 times farther from its parent star than the Earth is. Though discovered in the mid-19th century, Neptune remained largely cloaked in mystery until 1989, when the U.S.-launched Voyager 2 spacecraft did a close flyby, gathering a panoply of photos and revealing some interesting surprises. The solar system consists of the sun, which is a star and by far the largest object in the mix; eight "regular" planets, which in order from innermost to outermost are Mercury, Venus, Earth, Mars, Jupiter, Saturn, Uranus and Neptune; five "dwarf" planets; in the neighborhood of 200 moons, which orbit both planets and dwarf planets; about 780,000 asteroids, which orbit the sun between Mars and Jupiter; about 3,500 comets; and a variety of meteoroids, unknown in number. The four innermost planets are the small terrestrial planets, so named because they are made almost entirely of rock. The outer four planets are the giant gas planets, which consist mainly of gas surrounding a solid core. Neptune is the smallest of these, but it is still enormous compared to Earth, the largest of the terrestrial planets. Only Mercury and Venus have no moons at all. Each of the giant gas planets is surrounded by at least one ring composed of rocks and ice particles, with Saturn famed for the especially prominent rings that set it apart from all of its solar-system neighbors. As vast as the solar system is, it is tiny compared to its immediate and more distant surroundings. The solar system is part of the Milky Way Galaxy, a spiral-shaped agglomeration of stars and interstellar dust with four arms that orbit around the galaxy's own center. The solar system is pulled along in one of these arms at a speed of over half a million miles an hour, though of course you'd never know you were moving at such a dizzying speed. It takes the solar system about 230 million years to orbit the center of the Milky Way. The Earth's average distance from the sun is about 93 million miles. The reason this distance is given as an average distance is because the Earth's orbit, like all planetary orbits, is not circular but elliptical, or oval-shaped. The Earth actually ranges in distance from the sun from about 91 million miles at its closest approach to about 95 million miles six months later each year at its farthest point. As one moves outward from the sun to each planet's orbit, the successive distance between neighboring planets grows increasingly large. The Earth's average distance of 93 million miles is called one astronomical unit, or AU. When comparing the distance between planets, it is useful to scale these in AU rather than describe them in absolute distances, because this both offers a clearer picture of the overall arrangement of planets and introduces numbers that are easier to wrap your mind around. Mercury's distance from the sun is 0.4 AU, that of Venus 0.7 AU and that of Mars 1.5 AU. Relatively speaking, then, given that Neptune, as mentioned, is 30 AU from the sun, the terrestrial planets are grouped in a tight cluster. The Asteroid Belt, serving as a de facto boundary between the terrestrial planets and the gas giants, is 2.8 AU from the sun. Note that the jump in distance from Mars to the Asteroid Belt, 1.3 AU, is thus almost as great as the distance from the sun to Mars. 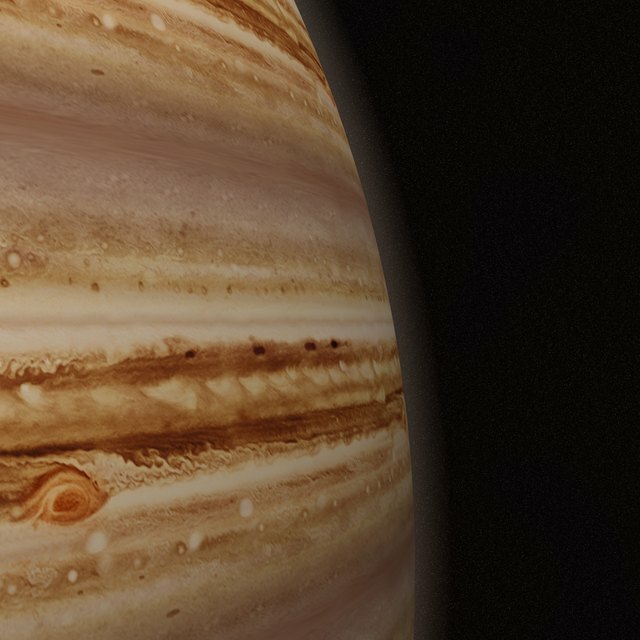 The gas giants reveal a continuation of this ever-widening orbit gap. Jupiter is 5.2 AU away from the sun and 2.4 AU farther out than the Asteroid Belt; Saturn 9.6 AU from the sun and 4.4 AU from Jupiter's orbit; Uranus 19.2 AU from the sun and 9.6 AU from Saturn's orbit; and Neptune, at 30.0 AU from the sun, is 20.4 AU outside the orbit of Uranus. Consider how truly lonely this makes Neptune; it's like living in a house 3 miles from the center of a small village, when all of the other residents are within a mile, half of those are within about a quarter of a mile and the only other resident who lived farther out than you suddenly moved away. 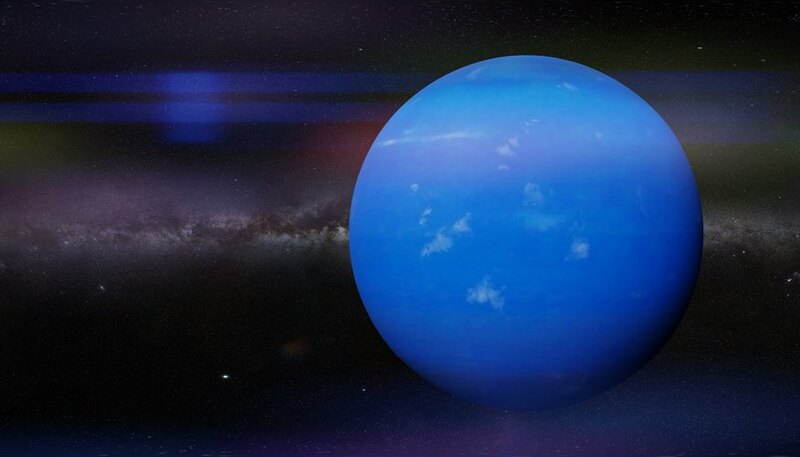 Neptune, which takes 165 Earth-years to orbit the sun and is about four times the diameter of Earth, is the closest solar-system object to the sun that is never visible to the unaided eye. (Uranus, for all practical purposes, usually can't be seen from Earth without binoculars or a telescope either. But in fact, some eagle-eyed observers can spot it when it's as close to the Earth as it ever gets.) It was discovered in 1846, and until Pluto's discovery in 1930 it was thought – correctly, as it turns out, sort of – to be the most distant planet from the sun. But Pluto's orbit is so elliptical (one of the reasons for its eventual "demotion") that between 1979 and 1999, its orbit actually brought it inside Neptune's, making Neptune the most distant planet regardless of arguments about what does and doesn't merit the title of "planet." Because light travels at 186,000 miles per second and Neptune is 2.8 billion miles from the sun, it takes the sun's rays over 15,000 seconds to reach Neptune, or more than four hours. All things considered, then, it's pretty amazing that it took only 10 or so years for a spacecraft launched from Earth, Voyager 2, to reach Neptune after being launched in 1977. The discovery of Neptune itself reveals the elegant nature of science and cooperation between people in different disciplines. A 19th-century French mathematician named Urbain Joseph Le Verrier suspected that a planet had to exist outside the orbit of Uranus owing to perturbation's in the orbit of Uranus that could only have come from an object large enough to exert small gravitational effects on Uranus. He submitted his ideas to the French astronomer Johann Gottfried Galle in Germany, who discovered Uranus on his first night of searching. It was only 17 days later that Neptune's largest moon, Triton, was found. The much-anticipated 1989 Voyager fly-by of Neptune offered humans the first close-up look at the planet. The spacecraft revealed six previously unknown moons; at the time of Voyager's fly-by, Triton was the only known Neptunian natural satellite. Triton, the sixth-largest moon in the solar system, is a wonder unto itself. Voyager revealed that the moon has both volcanic activity and seasons of its own, and Triton is an oddity in that it revolves around Neptune in the direction opposite of that in which Neptune rotates, a seeming gravitational contradiction. Voyager 2 also found a semi-permanent storm large enough to contain the entire Earth swirling away on Neptune's surface, dubbed "The Great Dark Spot" (a tribute of sorts to the famed Great Red Spot of Jupiter). This storm boasted winds in excess of 1,000 miles an hour, the fastest known in the solar system. Beck, Kevin. "What Is the Distance From Neptune to the Sun?" Sciencing, https://sciencing.com/what-distance-neptune-sun-4570214.html. 27 November 2018.